M Saxena, P Kaur, H Saxena, K Kaur. Humoral and cellular immune responses to Pasteurella multocida in fish exposed to heavy metal polluted water. The Internet Journal of Veterinary Medicine. 2008 Volume 6 Number 1. In the present studies aimed at assessing the humoral and cellular immune response of heavy metal aquatic pollution - exposed fish to microbial antigens, the T and B cell levels in the peripheral blood before and after challenge with Pasteurella multocida antigens were analyzed in normal and heavy metal pollution exposed fish. The mean percentage of T cells increased very significantly (p<0.01) after stimulation with the antigen in case of pollutant –exposed as compared to the normal fish. The mean percentage of T cells after antigenic stimulation in pollutant – exposed fish was very significantly (p<0.0001) higher than that of normal fish. The mean percentage of B cells decreased very significantly (p<0.01) after stimulation with the antigen in case of pollutant –exposed as compared to the normal fish. The mean percentage of B cells after antigenic stimulation in pollutant – exposed fish was very significantly (p<0.0001) lower than that of normal fish. Pollution of water with harmful chemicals, heavy metals, trace elements etc. may adversely affect the immune system of fish leading to decreased production, increased susceptibility to diseases and mortality. However, the precise effects on various components of the immune system are still unclear. The present studies were aimed at assessing the humoral and cellular immune response of pollutant exposed fish to Pasteurella multocida. The T and B cell levels in the peripheral blood before and after challenge with microbial antigen were studied in normal and pollutant exposed fish for this purpose. Fish: - Carp (Cyprinus carpio) weighing approximately 200-300 gm were obtained from fish farms of the College of fisheries, Guru Angad Dev Veterinary and Animal Science University, Ludhiana .Two groups of 8 fish each were maintained at the farm in 600 L plastic pools with aerated water at a temperature between 25°C to 30°C. One group of fish was exposed for 1 month to a cocktail of eight heavy metals at a concentration of 4% of the levels commonly found in the polluted water of the local drain Buddha Nallah. Both the groups were fed commercially available food. Antigen Preparation:- Pasturella multocida organisms were grown in Brain Heart Infusion (BHI) broth for six hours at 37°C. Then the broth containing the organisms was put in Roux flasks containing BHI Agar and incubated for 18 hours at 37°C. Cells were then harvested by putting glass beads into the Roux flasks and shaking them. Cells were collected by a pipette and centrifuged at 10,000 x g for 30 minutes. The pellet was then washed twice with NSS and the cells were suspended in 10mm HEPES buffer, sonicated five times at 10µ for one minute each. Sonicated cells were then centrifuged at 1700 x g for 20 minutes to remove the intact cells and the debris. The sonicated cells were then treated with 0.3% formalin and the treated cells were used for Immunization. Immunization of fish:- Normal healthy and pollutant exposed fish were injected intraperitoneally with three doses of formalin killed Pasturella antigen mixed with equal volume of adjuvant at 10 days interval, keeping equal number of fish of similar weight as control. The inoculated fish were bled six days after the last injection. Blood was collected from the fish in both groups for counting the lymphocytes. Separation of Lymphocytes:- Heparinized blood samples were taken from the fish by puncturing the heart. The blood cells were centrifuged at 800 x g for five minutes at 4°C in RPMI-1640 and the buffy coat cells were collected and washed .The leucocytes were then overlaid onto Histopaque (Sigma) and centrifuged (350 x g, 20 min, 4°c) to separate the peripheral blood mononuclear cells . The cells were washed with RPMI-1640. Cell viability as determined by Trypan Blue exclusion test was more then 90%. E-Rosette Formation:- After adjusting the cell count, 0.2 ml of PBL suspension was mixed with 0.2 ml of one percent SRBC suspension, centrifuged at 100 g for five minutes and kept overnight at 37°C. The rosette forming and non rosette forming cells were counted the next morning. In case of normal fish, the mean percentage of T cells after antigenic stimulation was significantly (p=0.02) lower than that without stimulation. However, interestingly, the mean percentage of T cells increased very significantly (p<0.01) after stimulation with the antigen in case of pollutant –exposed fish (Table 1). 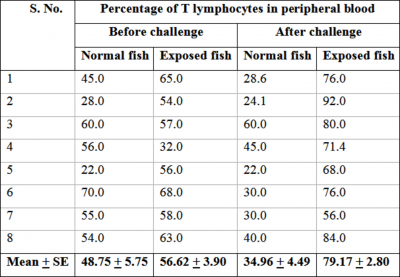 The mean percentage of T cells without antigenic stimulation was 48.75 ± 5.75 in case of normal fish and 56.62 ± 3.90 in case of pollutant – exposed fish. The mean value after antigenic stimulation was 34.96 ± 4.49 in case of normal fish and 79.17 ± 2.80 in case of pollutant – exposed fish, respectively (Table 1). The difference in mean percentage of T cells without antigenic stimulation in case of normal fish was not significantly different from that of pollutant – exposed fish. However, interestingly, the mean percentage of T cells after antigenic stimulation in pollutant – exposed fish was very significantly (p<0.0001) higher than that of normal fish. In case of normal fish, the mean percentage of B cells after antigenic stimulation was significantly (p=0.02) higher than that without stimulation. 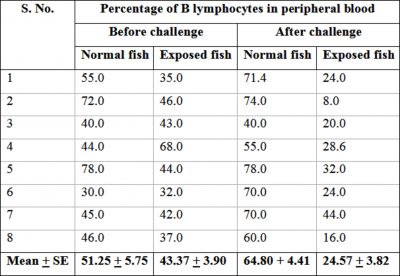 However, interestingly, the mean percentage of B cells decreased very significantly (p<0.01) after stimulation with the antigen in case of pollutant –exposed fish (Table 2). The mean value of percentages of B cells without antigenic stimulation was 51.25 ± 5.75 in case of normal fish and 43.37 ± 3.90 in case of pollutant – exposed fish. The mean value after antigenic stimulation was 64.80 ± 4.41 in case of normal fish and 24.57 ± 3.82 in case of pollutant – exposed fish, respectively (Table 2). The difference in mean percentage of B cells without antigenic stimulation in case of normal fish was not significantly different from that of pollutant – exposed fish. However, interestingly, the mean percentage of B cells after antigenic stimulation in pollutant – exposed fish was very significantly (p<0.0001) lower than that of normal fish. The present studies were undertaken to study the effect of water pollution with heavy metals on the immune response of fish. The levels of T cells and B cells in the peripheral blood of fish was assessed before and after challenge with bacterial antigen prepared from Pasteurella multocida. The antigenic challenge decreased the percentage of T cells in normal fish but increased in pollutant – exposed fish. This may possibly imply that certain heavy metals may have a stimulating effect on cell mediated immunity at low doses. However, interestingly, the levels of B cells decreased very significantly after stimulation with the antigen in case of pollutant – exposed fish. Whereas, B cells of normal fish increased significantly after antigenic stimulation indicating that the humoral immune responses may be suppressed by exposure to heavy metals. The present study has revealed that exposure of fish to water polluted with heavy metals leads to variable responses of the two subsets of lymphocytes (B & T) to antigen. It has been speculated (O’Neill, 1981) that metals may disturb the metabolism, ionic balance and cell division of immunocompetent cells. Among the metals, Manganese has a relatively low toxicity to fish (Hetrick et al., 1982). It is an essential trace element for various functions. Chronic exposure of carp to Nickel, Zinc, Copper or Chromium has been reported to suppress to a variable extent the primary humoral response to bacteriophage. Copper was found to cause immunosuppression of antibody producing cells in rainbow trout when tested in vitro (Khangarot and Tripathy, 1991) and in air breathing catfish in vivo in a dose dependant manner along with the depressed phagocytic activity of spleen and kidney macrophages, and suppression of T cell activity as indicated by prolongation of allograft rejection time (Anderson et al., 1989). Defense against internal infections can be compromised by prolonged exposure to Copper (Malins et al., 1988). Different concentrations of Copper or Zinc have been reported to cause dose – dependant suppression of kidney lymphocyte numbers and natural cytotoxic cells (Merchant and Packer, 1983). Cadmium causes both, immunosuppression and immunostimulation in mammals depending on a variety of factors. T cell activities are usually suppressed whereas the effects on B cells are more varied. A concentration of 10 - 12 g/ml is about half the LC50 of Cadmium. This concentration has been reported to cause inhibition of serum antibody titres in one species of fish but six fold stimulation in another (Newman and MacLean, 1974). A concentration of 0.7 or 3.6 g/L has been reported to cause suppression of T lymphocyte function but enhancement of antibody response to bacterial challenge (Nielsen et al., 2001). Cadmium can have a marked effect on differential leukocyte counts in fish. A dose-dependant decrease in lymphocytes has been reported (O’Neill, 1981). Elevated cortisol may be a primary mechanism for immune system suppression in fish exposed to a variety of pollutants. Most fish exhibit an elevated plasma cortisol level in response to nearly any stressor. However, Cadmium alone among the metals fails to induce this hormonal change. Exposure of fish to Lead for upto 183 days was reported to produce a reduction in spleen size but an increase in leukocyte number (Robohm, 1986). This work was supported by a Part-Time Research Associateship of the University Grants Commission of India to Dr. Madhu Saxena. Address: Flat no. 9, First Floor, Geetanjali Apartments, E – Block, Rishi Nagar, Ludhiana 141001 India (hmsaxena@yahoo.com). r-0. Anderson, D. P., Dixon, O. W., Bodammer, J. E., Lizzio, E. F., 1989. Suppression of antibody – producing cells in rainbow trout spleen sections exposed to copper in vitro. J. Aquat. Anim. Health 1, 57.
r-1. Hetrick, F. M., Robertson, B. S., Tsai, C. F., 1982. Effect of heavy metals on the susceptibility and immune response of striped bass to bacterial pathogens. National Oceanographic Atmospheric Administration Publication 82112603 p32. fossilis following copper exposure. Ecotoxicol. Environ. Safety 22, 291.
r-3. Malins, D. C., McCain, B. B., Landahl, J. T., Meyers, M. S., Krahn, M. M., Brosn, D. W., Chan, S. L., Roubal, W. T., 1988. Neoplastic and other diseases in fish in relation to toxic chemicals: an overview. Aquatic Toxicol. 11, 43.
r-4. Merchant, I. A. and Packer, R. A. (1983) Veterinary Bacteriology and Virology. CBS Publishers and Distributors, Delhi p255. r-5. Newman, M. W., MacLean, S. A., 1974. Physiological response of the cunner, Tautogolabrus adspersus to cadmium. VI. Histopathology. National Oceanographic and Atmospheric Administration Technical Report. NMFS SSRF 681, 27.
r-6. Nielsen, M. E., Hoi, L., Schmidt, A., Qian, D., Shimada, T., Shen, J. and Larsen, J. (2001) Is Aeromonas hydrophila the dominant motile Aeromonas species that causes disease outbreaks in aquaculture production in the Zhijiang Province in China? Diseases of Aquatic Organisms 46: 23 – 29.
r-7. O’Neill, J. G., 1981. Heavy metals and the humoral immune response of freshwater teleosts. In Stress and Fish. Pickering, A. D. (ed.) Academic Press, N York p 328.
r-8. Robohm, R. A., 1986. Paradoxical effects of cadmium exposure on antibacterial antibody responses in two fish species: inhibition in cunners (Tautogolabrus adspersus) and enhancement in striped bass (Morone saxatilis). Vet. Immunol. Immunopathol. 12, 251.